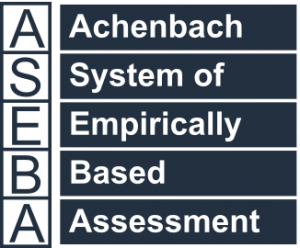 ASEBA-Web’s advanced technology provides an enhanced user experience, involving web-based administration of assessments, collection of data from informants (or traditional key-entry from printed form), processing, scoring, cross-informant comparisons, and storage of data. ASEBA-Web enables online administration of ASEBA assessment forms for ages 1½-5, 6-18, 18-59, and 60-90+. This is a subscription service that is renewable on an annual basis and requires e-units to administer assessments via the web. Our system and programs have been designed and implemented to meet the requirements of the Health Insurance Privacy and Accountability Act (HIPAA). The subscription service uses “e-units” to administer and score assessments. E-units are available for purchase in various increments, see ASEBA-Web Products at our online store. ASEBA-Web is administered in English though several language options are available to informants. Similarly, clinicians have the ability to print Dutch, Icelandic, Latino-Spanish, and Norwegian translations of most forms in ASEBA-Web.